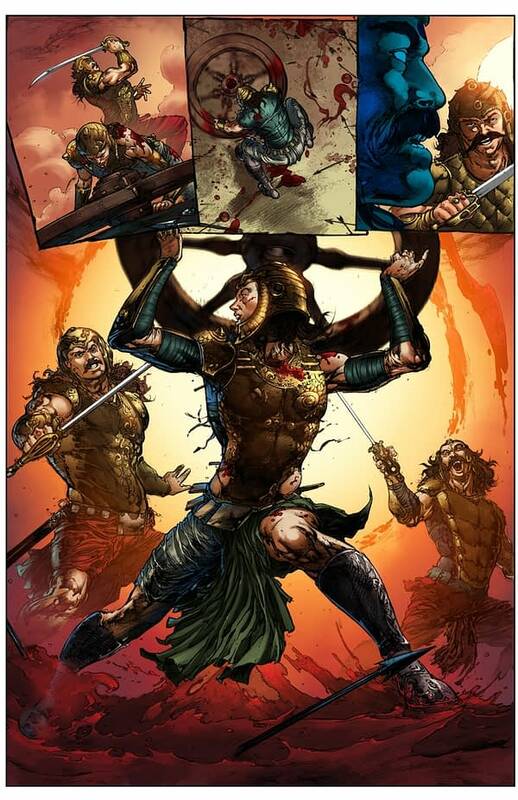 Dheeraj Verma, artist on Transformers and Conan, has been working on a new graphic novel, The One: Abhimanyu, for the last six months telling the story of the 16-year boy Abhimanyu from The Mahabharata, one of the major Sanskrit epics of ancient India, with colourist Periya Pillai. 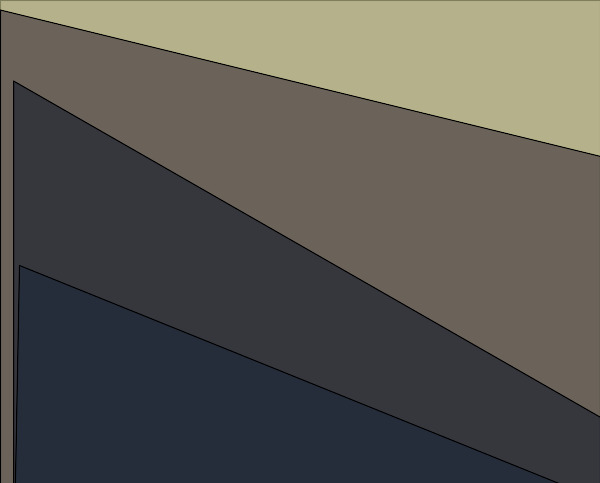 In the year 3137BC a Great War was waged between the powers of good and those of evil. A war the shook the soul of man. 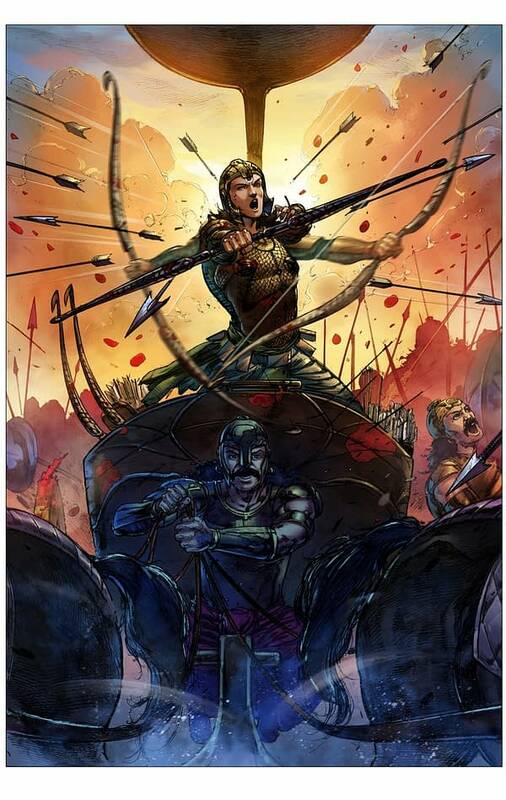 A war that was fought for righteousness….The Dharma. A war that was overlooked by Krishna, the Lord of the universe, himself. A war that we now know as “The Mahabharata”. 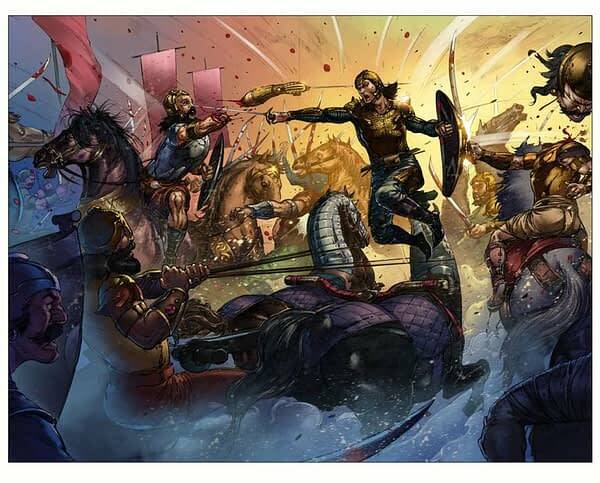 This is a story of a brave soul that set foot in the battlefield of Kurukshetra, as a warrior in his mere teens fighting immoral veterans three times his age and experience and in doing so, conquering the hearts of millions thereafter. This courageous soul, a mere boy of 16 went by the name of ” The One”. The boy descended into the holy bloodbath between the Kauravas and the Pandavas on the 13th day from the side of the Pandavas. His war-cry bellowed his intention of spearing headfirst into the deadliest battle-formation of the time called the chakravyu. His prowess on the pits of war took everyone by surprise, when the violent storm of death and massacre that he raised left 200000 people and animals dead in its wake. But this storm didn’t go on for long. The lord of deceit was on the side of the enemies. And so through devilish means they got the best of our young warrior. 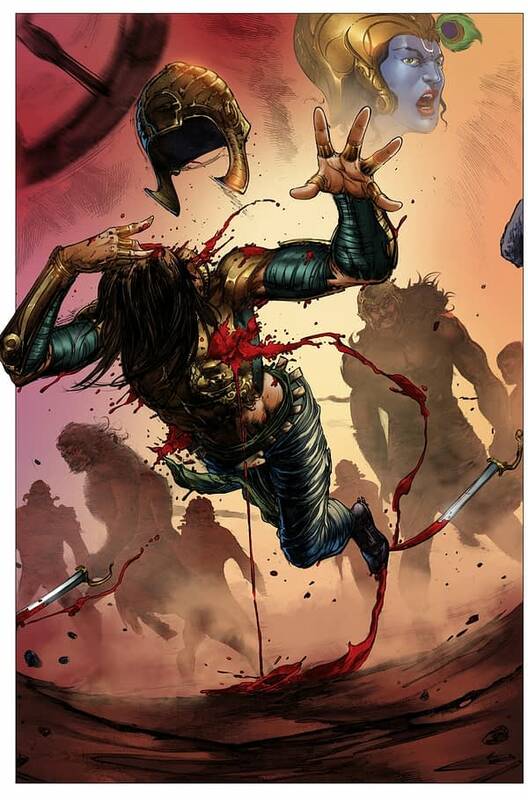 Thus on the very day that he made his prodigal debut, several of the Kaurava veterans ambushed him in the devious formation of the chakravyu, following which he was unfairly slaughtered by the powers of evil. The thundering roar of the felled warrior can still be heard tearing through the pages of mythology, right into the depths of our hearts, viciously crying out against the unfairness of war. 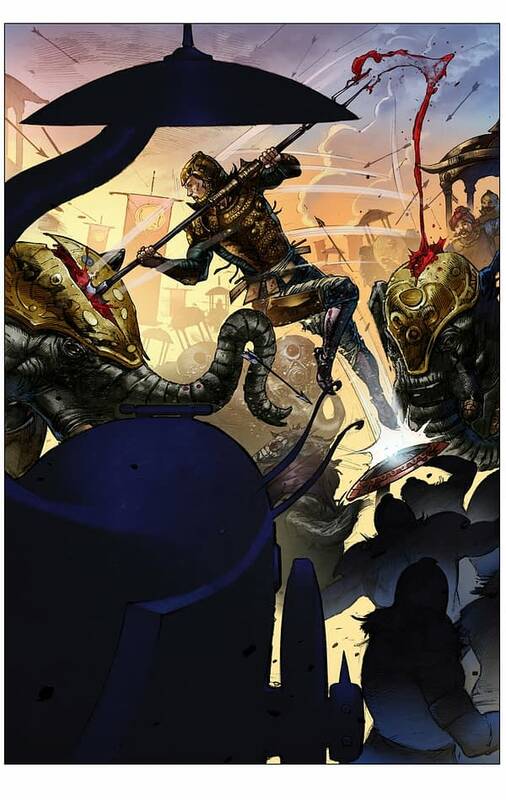 The graphic novel also seeks to detail visuals of The Chakravyu for the first time, one of the most intricate and complex battle-formations. The One: Abhimanyu will be published… at some point… from Mythtower. 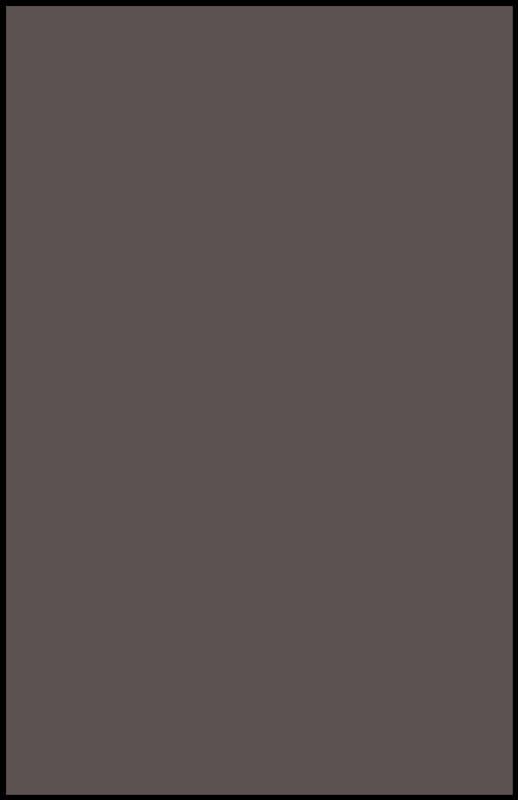 And is being Kickstarted right here.